The 2015 NBA Finals are finally here and Panini is honoring the big matchup with 2015 Panini NBA Finals Private Signings Basketball. 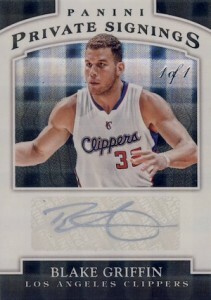 The limited promotional product was available at Panini's online store in exchange for purchases. However, the promo sold out very quickly and cards are showing up online. Those who purchased select Panini basketball products were eligible to receive packs that contained 2015 Panini NBA Finals Private Signings Basketball cards. For every $100 worth of products, collectors earned one 2015 NBA Finals Promo pack. Each pack contained one guaranteed autograph in a sealed magnetic case. 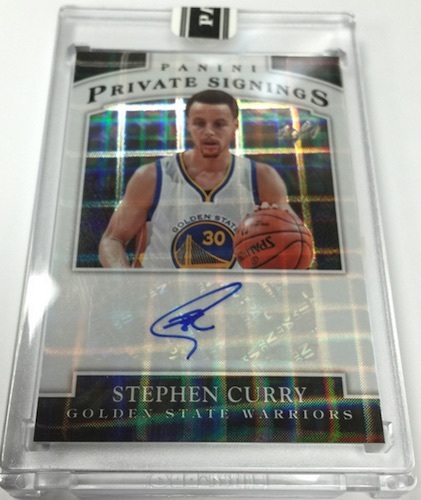 The cards are exclusive to the 2015 Panini NBA Finals Private Signings Basketball promotion. Private Signings autographs are the main set and feature sticker autographs for veteran and retired players such as Kobe Bryant, Stephen Curry, Larry Bird and Magic Johnson. All the cards are limited to 25 copies or less and there is also a HyperPlaid parallel for most players, numbered one-of-one. First-year players have a detailed focus with Private Signings Rookies. 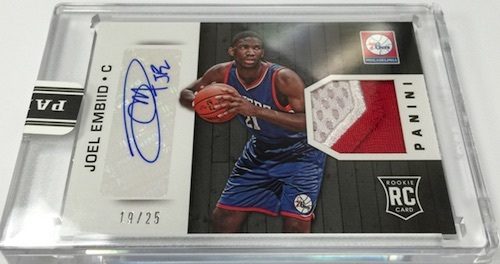 These cards are also limited to 25 copies or less and feature sticker autographs for Andrew Wiggins and other top rookie players from 2014-15. 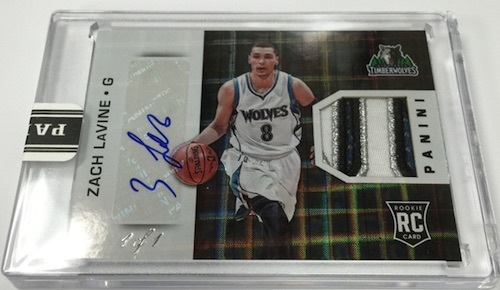 Finally, Rookie Signature Materials switches to a horizontal layout and adds a memorabilia piece. The autographed relic cards are each numbered to 25. 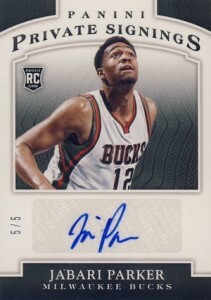 Like the base Private Signings, the rookie autographs also have a HyperPlaid parallel (#1/1). The full list of eligible products is shown below but is contingent on what is in stock on the Panini site. View a gallery featuring most of the cards here. 59 cards. Serial numbered #/25 or less. 30 cards. Serial numbered #/25 or less.